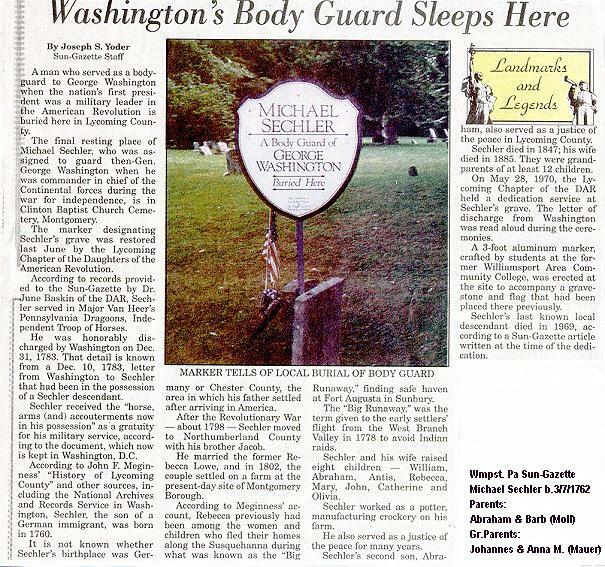 Michael Sechler was one of George Washington's body-guards during the, Revolutionary war. His grandfather, Johannes Sechler, immigrated from Germany to Pennsylvania. Micheal's parents were Abraham Sechler and Barbara Moll. Michael Sechler married Rebecca Lowe, and in 1802 they settled on a farm where the borough of Montgomery is now located. During the "Big Runaway" Rebecca Lowe was among those who escaped by canoes from their homes along the Susquehanna river, and found protection at Fort Augusta. Michael and Rebecca (Lowe) Sechler were the parents of eight children who grew up: William; Abraham; Antis; Rebecca; Mary; John; Catherine, and Olivia. He was a potter by trade and manufactured crockery on his farm. He also served as a justice of the peace for many years. Michael Sechler was also a mason and eventually rose to the level of Worshipful Master. "Michael Sechler petitioned Lodge No. 22 on March 30, 1790, and his prayer was granted and he was initiated April 28, 1790. The minutes of May 12, 1790, say: "Michael Sechler is going on a journey with Colonel Frederick Antes so he was passed and raised, and paid 2 pounds 5 shillings." He was elected Senior Warden November 28, 1792, and again at the stated meeting held June 13, 1794. He was elected Worshipful Master December 6, 1794, and served as such until St. John the Baptist's Day following. He removed to Clinton Township, Lycoming County, where he died on the twenty-third of April, 1847, at the age of eighty-seven years. He was said to have been the last survivor of the Life Guard of General George Washington."